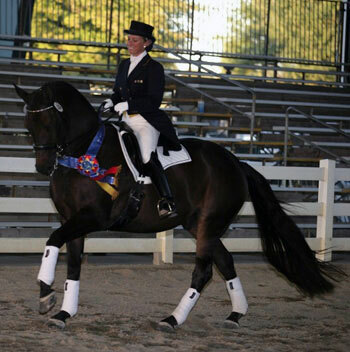 After two years of conventional medical treatments from October 2011 thru April 2013, the future of my talented dressage horse Tabasco was murky at best. He was sore in several body areas, dragging the toes of his hind hooves, and often had lameness from somewhere in his left hind leg. It was a puzzle as to the cause of these symptoms and two years of medication and injections were not successful. Dr. Jobert began her work with us starting in May of 2013. The process has been both interesting and educational. Tabasco obviously enjoys his treatments, and every session restored him to a little more comfort and balance than before. By this April of 2014, his sparkling personality was back and we are working towards Level 1 again, he is comfortable and lovely in his work with, his future looking very bright. After graduating from college, I moved my horse back home to New Orleans. My horse unfortunately was coming from full pasture to living in a stall 18-20 hours a day. After a few weeks of being home I noticed he wasn’t behaving like his usual self. Although he is a bit grouchy on the ground, he was becoming worse by the day; grooming around his shoulders was especially becoming a battle and he wasn’t picking up his canter leads correctly after moving home. Upon jumping he was starting to sit down on the back rails of oxers and trail his hind end under him over verticals, this to me was the lightbulb moment that he was off. After a flex test, with no lameness detected in his legs, I did some research on chiropractic work and came across Dr. Jobert’s name. Before I have anyone do work on my horse I try to either talk to people about their experiences with the person or do research on my own about them and was only able to find very positive things about Dr. Jobert. I sent her an email explaining my horse’s symptoms and when she would be available to come out to examine him, within an hour she got back to me and was ready to schedule an appointment a day later; she was also extremely accommodating to my work schedule since I would not be leaving the office till about 5:30 and she offered to come out in the evening. Upon meeting me and my horse she took about ten minutes getting to know my horse, what he did, and what his future goals were looking like. She really took her time formulating a plan for him and how to go about his treatment. Dr. Jobert is not the kind of doctor who treats every animal the same, she adjusts each treatment to each individual patient and I really appreciate that dedication to each client she has. After finishing she took the time to go over some stretching exercises to do with him a few times a week and to answer any questions I may have about going forward with his work schedule, and made sure that I understood what she was recommending. 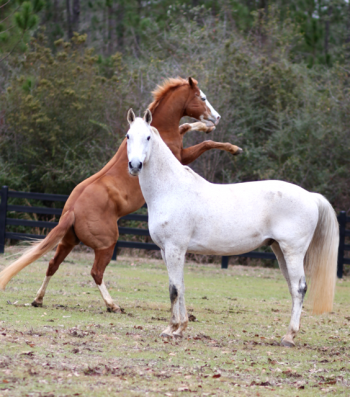 Dr. Jobert’s number one priority is getting the horse back into a comfortable state of being and happy to do their work, in an ethical and patient manner. Something I know that people watch out for is how their horses are handled by the people working on them and there are three people I trust with handling my very grouchy horse patiently: my vet, my farrier, and Dr. Jobert. I have never seen her get upset over a horse behaving badly during treatment, she always takes her time getting them to calm down and relax. I am proud to say that Dr. Jobert has been my horse’s chiropractor for well over a year and will continue to be his chiropractor for as long as possible. I have seen nothing but improvement from him in his work and how feels after being adjusted. With Dr. Jobert’s help I am now able to better pick up on behavioral changes that indicate when he may be hurting so we can adjust him before he gets more sore. My horse is now jumping beautifully and even my trainer compliments how he feels after Dr. Jobert has worked on him. 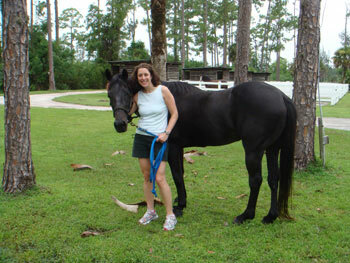 There are not enough great things to say about Dr. Jobert and what her therapy has done for my horse. Thank goodness for Dr. Jobert and her expertise in acupuncture and chiropractic work! She has a quiet way with horses, as one of mine is not a real people person, let’s just say, and Dr. Jobert has been fabulous with him! I am a Grand Prix competitor and trainer, and she has not only helped my Grand Prix horse, Martailo, stay comfortable, but she has also helped my young horse, Windsor, through some tough injuries that young horses like to do to themselves! She is patient and kind, is always willing to help in any way she can, and has always followed up with a phone call to ask how the horses are doing. As a professional trainer, this type of work ethic and professionalism is very important to me. 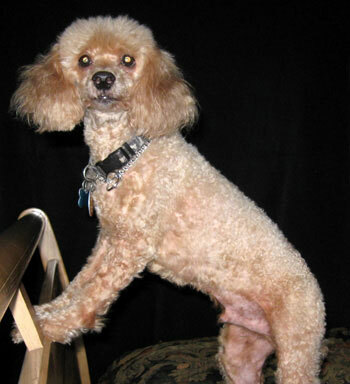 Trolito is an 8 year old French poodle, extremely active, but very sensitive. One Saturday afternoon, we noticed that he was not walking normally. By the next day he could not stand up. We rushed him to a veterinarian, where they told us he had no deep sensation in his hind legs. They only gave him a 10% chance to walk again if he went through a $5,000 operation and was treated with cortisone. We got a second opinion, but it was as bad as the first. At this point, we considered euthanasia, but some friend told us to consider physical therapy and acupuncture before taking such harsh measures. We called Dr. Jobert, and she gave us some hope. After examining and becoming friends with Trolito, she recommended a treatment plan. After six weeks of treatment, Trolito was back on his feet and moving freely around the house. Now he is 95% recovered and has been so for over three months. We are very happy to have our sweet and active dog back. I believe Michelle is Trolito’s personal guardian angel. Without her, he would not be with us today. Thank you very much, The Arribas Family. Dr. Jobert has truly been a miracle worker for my 29-year old horse, Summer Solstice. Dr. Jobert began applying acupuncture techniques to Solstice approximately 2 years ago, after she began having serious joint and ligament problems in her legs and developed Cushings disease. In the past two years, Solstice’s legs have improved. The Cushings problem has been resolved, and Solstice seems to be in a reverse-aging process! Thanks to Dr. Jobert, Solstice looks healthier and stronger with each month that goes by. 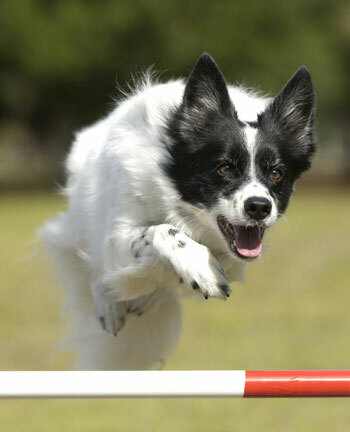 I have three dogs training and competing in multiple dog sports including agility, obedience, sheep herding and tracking. Dr. Michelle Jobert sees my dogs regularly to ensure that they are kept in tip-top condition and are able to perform successfully at the top levels of competition. Thanks to Dr. Michelle’s knowledge and skill, my 10 1/2 year old Border Collie, Arrow, is not only still capable of competing, but places consistently at the top of her classes. I feel very comfortable recommending Dr. Michelle Jobert to you in order to maintain or enhance your pet’s quality of life. December 9, 2013 presented a crossroad for our family, where we had to decide whether to give in to conventional thinking or believe that our beloved 12 year old dog Dottie had a lot to live for. Dr. Jobert believed in our Dottie when everyone else had given up on her. 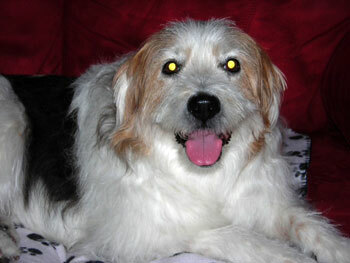 She was consulted to help Dottie with her arthritis but ended up saving her life. Dr. Jobert changed our way of thinking from counting the days until our Dottie would pass on to realizing that Dottie still had a lot of living to do. Dr. Jobert reasoned that as a senior dog, Dottie just needed help just like our senior humans need help as they get up in years. The treatment which included use of herbs, laser, acupuncture and change of diet reversed Dottie’s health from declining to ascending. We noticed that Dottie’s coat began to have the shades of brown that had recently been absent and that her overall personality went from lethargic to spirited again. Dr. Jobert told us that our home had such a down trodden mood after two conventional veterinarians had all but told us to take Dottie home and make her comfortable with an expected week to live. She told us that the healing had to start with my wife and I and that the mood had to be cheerful. Dottie had a lot of living to do according to Dr. Jobert. My wife has described Dr. Jobert as the angel we needed, who came in and saved our Dottie. We are relishing every day that we have with Dottie and enjoying her to the fullest. Dr. Jobert’s “refuse to lose” attitude has lifted Dottie and everyone in my family. And has us all “Well adjusted”.